A woman carrying a child under a blanket walks on a muddy path in the southern Serbian town of Preševo, on the border with the former Yugoslav Republic of Macedonia. Warning of a “massive” increase in the numbers of children on the move to Europe, the United Nations Children’s Fund (UNICEF) announced today that it will be appealing for $14 million to address the needs of migrant and refugee children who have escaped war-torn countries such as Syria, Iraq and Afghanistan. UNICEF spokesperson Sarah Crowe told reporters at the regular press briefing in Geneva that the agency’s presence in all countries should help in allotting the funds appropriately to create child-friendly locations, health care, food, shelter and other humanitarian services. 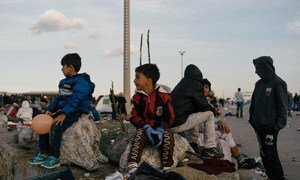 The agency reported that there has been an 80 per cent increase in the number of children moving through Europe with approximately 19,000 children arriving each month. According to Eurostat data, there were 133,000 children who sought asylum between January and July 2015. Ms. Crowe also introduced Valentina Otmacic, UNICEF representative in Croatia, who described the harsh conditions for migrant children in that country. Ms. Otmacic recounted a traumatic incident at a child-friendly zone in a camp in Opatovac, Croatia, where a 9-year-old Afghan boy had tried to commit suicide by cutting his neck with a metal lid before being stopped. The agency announced that it would be providing support to European governments to ensure that the policies and procedures undertaken by them serves the best interests of the children and are in compliance with internationally accepted standards. “With so many children on the move, and with winter in Europe approaching, our priority has to be caring for these children now. Working alongside governments and other partners across Europe, wherever our support is needed, UNICEF will do all it can so that refugee and migrant children are safe, healthy and that their rights and dignity are fully respected.” said Marie-Pierre Poirier, UNICEF’s Special Coordinator for the refugee and migrant crisis in Europe. Ms. Sarah Crowe stressed that the priority for the agency still remains the Syrian crisis, where there are seven million children in need and the relief effort underfunded by some $500 million. Secretary-General Ban Ki-moon joined the United Nations High Commissioner for Refugees today in welcoming a decision by the European Union (EU) to increase resources for humanitarian assistance to countries neighbouring war-ravaged Syria.